We have already seen the historical returns of the S&P BSE Sensex, which has given an average return of about 20% per year, despite volatility and price fluctuations of about -20% to +60%. The following table shows S&P BSE Sensex historical data - start & close values and the yearly returns of the sensex from 2000 to 2013. As far as the other major indices are concerned, CnxIT gained about 58%, whereas the BankNifty lost about 9% and the Cnx Midcap index lost about 5%. Despite the sensex gaining 9% for the year there were many stocks which have lost 95% and some stocks gaining about 10-200%, most of them from the Information and Technology sector. During the year the index hit an all-time high of 24483 and despite markets hitting all time highs only a few stocks made all-time highs or the highs which were made in 2008 bull run, while most of them are still languishing well below their historical highs. The message for retail investors is clear - index investing is better than individual stocks. Individual or Retail investors can achieve above-average returns by investing in index through Exchange Traded Funds (ETFs) like Nifty Bees or Top mutual funds, which have given consistent returns over longer term. How are you getting the average return of 20%? I calculated the IRR for an investment in the sensex in 2000 that matures in 2013, and the IRR is coming to 11%, not 20!!! That is a huge difference. Checking further it appears to me that 20% is close to the simple average of the returns in these years(precise no. is 17%, and not 20%). But since one wants to calculate the compounded average one needs to take the geometric mean of the individual year's return and NOT an arithmetic mean. Doing so gives the same result as my IRR calculation - a return of 11% compounded annually. sorry, I don't how I missed your comment. The returns were the periods for 1985-2007, where the CAGR is about 20.5%. 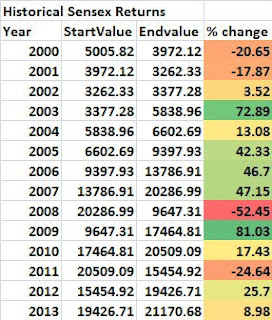 Yes, for the period you mentioned 2000-20013 the returns are about 11% only.But if any SIPs are done during the above periods the returns are about 15%. The thought behind these posts are to highlight the importance of systematic investing and staying invested for a longer periods of time.